Welcome to the GO Green Auto Club and Customer Service Site. 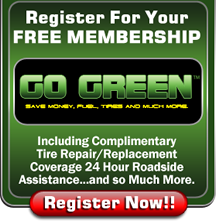 This site is dedicated to helping you enjoy the extraordinary benefits of nitrogen tire inflation and our Go Green Auto Club. Inflating and maintaining your tires with nitrogen can dramatically increase your fuel economy, tire life and safety while reducing your carbon foot print. Nothing you can do or buy for your vehicle will have as profound an impact on your wallet or our environment for such a reasonable cost. Go Green tire inflation should be the foundation of your vehicle maintenance program and your Go Green nitrogen dealer is committed to helping you realize the benefits and savings this simple regime will provide. Your FREE membership in the Go Green Auto Club is an expression of the confidence we have in our tire inflation program and a gift from your Go Green dealer for doing your part to keep your vehicle properly maintained, conserve fuel and help restore our embattled planet.